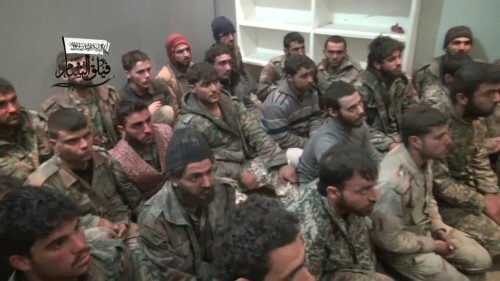 PHOTO: Captured Syrian forces this week after failed Aleppo offensive — do they include Iranians and Afghans? Iran’s Foreign Ministry has turned a major defeat for President Assad’s forces in Syria into a “full and quick victory” for “liberation from terrorists”. Reports on Thursday indicated that a surprise regime offensive north of Aleppo, Syria’s largest city, had been defeated by rebels. Syrian forces — including Iranian and Hezbollah fighters, as well as Afghans paid by Iran to fight in the four-year conflict — suffered heavy casualties. See Syria Daily: How Serious Are the Regime’s Losses in Failed Aleppo Offensive? In fact, the Syrian forces and Iranian and Hezbollah allies are besieged in the one village they still hold. An effort to cut the supply route to Aleppo, near Handarat, appears to have ended in a heavy defeat, with the rebel faction Jabhat al-Nusra killing scores of the attackers. Iran’s political, economic, and military support has long been vital for the survival of the Assad regime. However, in recent months, Tehran has stepped up its military involvement with commanders and fighters — reports indicate that Iranian personnel are now prominent in the Syrian military operations across the country. At the same time, Iran’s economic backing of Assad is under strain because of Tehran’s economic problems. Damascus is appealing — so far without apparent success — for an extension of a $3.6 billion line of credit, arranged in July 2013, which is soon to expire. PreviousSyria Daily, Feb 20: How Serious Are the Regime’s Losses in Failed Aleppo Offensive?